A child reacts to cholera treatment in L’Estere, Haiti. Haiti, the nation that cannot get a break, has become the epicenter of a Caribbean cholera epidemic. Nine months after an estimated 200,000 died in the Jan. 12, 2010 earthquake, watery diarrhea — a characteristic of cholera — began to beset Haitians. The toxins from the bacterium Vibrio cholerae upset the chemistry of the intestinal tract, causing diarrhea, dehydration and sometimes death. As of Oct. 17, 2013, the Caribbean epidemic has sickened 684,085 people and killed 8,361, according to the Centers for Disease Control. 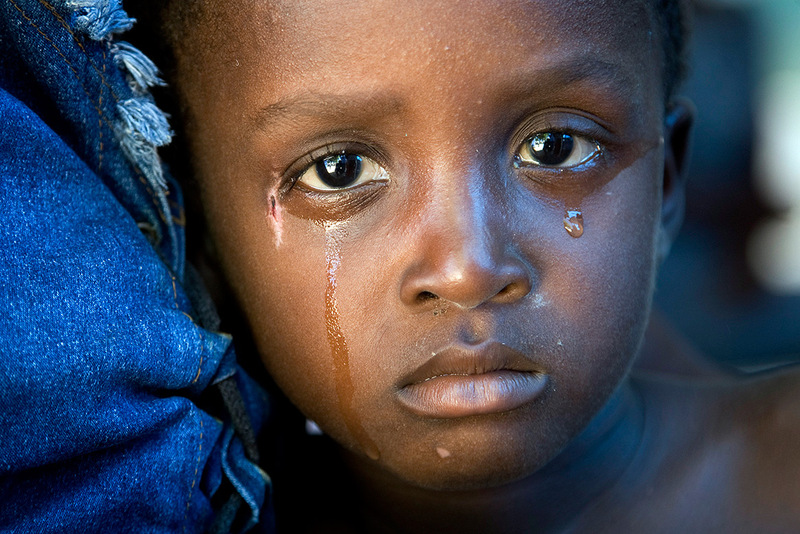 Annually, worldwide, cholera kills about 100,000 and infects three to five million. Cholera has now spread to Dominican Republic (31,090 cases and 458 deaths), Cuba (678 cases) and Mexico (176 cases between 9 Sept. and 25 Oct. 2013). Click on any bubble for more case information. Cholera is spread via feces, and the disease could spread when infected people travel to areas with poor sanitation. It’s also possible that aquatic animals harboring Vibrio cholerae have drifted across the sea. However, other affected countries are more developed and/or more organized than Haiti, so those epidemics may ebb before Haiti’s latest tragedy ceases. 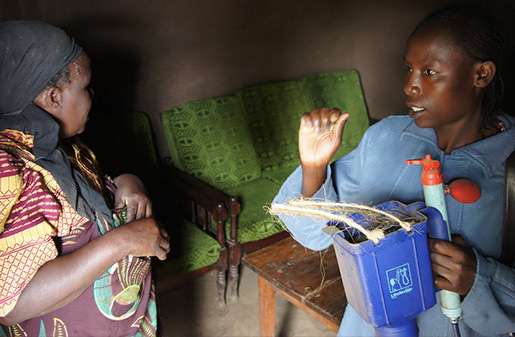 Lifestraw is an instant, point-of-use microbiological water purifier, shown in use in Kenya. The system is said to remove 99.9999 percent of waterborne bacteria through a super-fine filtration process. Roll over image to see the clean water coming from the Lifestraw, which is supposed to supply one person with fresh water for up to one year. A clean, just and prosperous world would have no cholera, as the bacterium is spread from feces into food or drinking water. 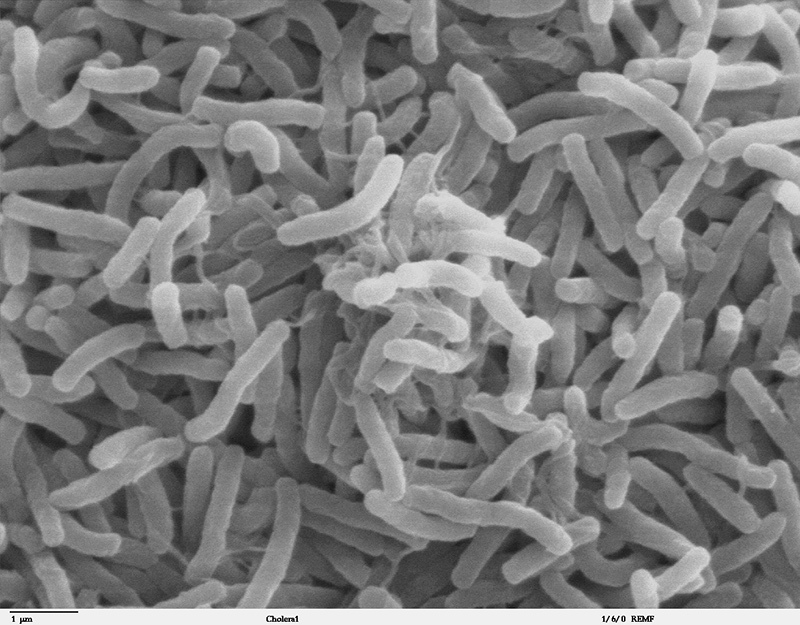 As cholera continues to ravage Haiti, what do we know about the bacterium and the disease? First off, the pathogen is extremely common. “Vibrio cholerae is part of the natural flora of aquatic systems: coasts, estuaries, rivers, ponds and lakes,” says Rita Colwell, professor emerita at the University of Maryland, who has studied the organism and its disease for 40 years. The bacterium lives with crustaceans called copepods and with drifting animals called zooplankton in relationships that likely provide benefits to both sides. According to the standard explanation, V. cholerae reached Haiti in a United Nations peacekeeper who arrived after the earthquake carrying the pathogen but without active cholera. But Colwell is not convinced. The genetics of the strains in Haiti “are not absolutely identical to the Nepal strain. They are related, but are also related to strains from Zambia, Asia and Mexico,” she says. 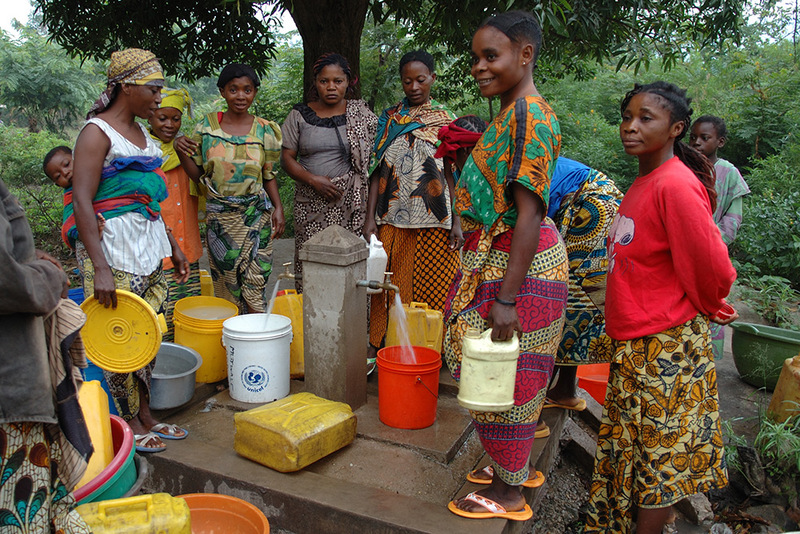 Cholera had been endemic in the Democratic Republic of the Congo after years of war and chaos destroyed water systems. In 2006, UNICEF, a local NGO and the water authority started to construct a 30-kilometer system to bring water from the hills to water fountains across the town of Baraka. The fountains supply clean water to more than 30,000 people; in 2007, according to the Flickr site below, cholera had all but disappeared in the area. When this so-called “persister form” was dropped into a richer environment, “It immediately flipped back to its normal self, ready to go and do its thing,” Morris says1. Scanning electron microscope image of Vibrio cholerae bacteria. The obvious way to deal with cholera is with effective sewage treatment and supplies of clean, safe water — measures that have the fringe benefit of preventing many other intestinal diseases. But that’s easier said than done in Haiti, which ranks #161 of 186 nations on the United Nations’ Human Development Index, and is still struggling to recover from the catastrophic 2010 earthquake. Oral rehydration therapy is a last-ditch, lifesaving treatment for cholera. These low-cost packages of salt and sugar restore a healthy chemical balance to the intestines, slowing or stopping the incessant, deadly diarrhea. 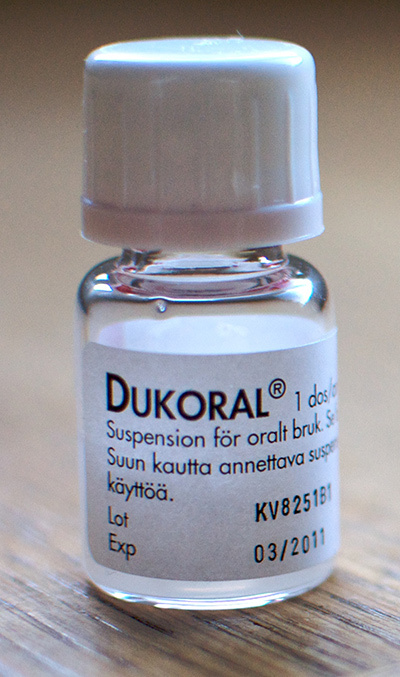 Dukoral is one of two oral cholera vaccines now on the market. Dukoral contains a mixture of inactivated Vibrio cholerae bacteria and a non-toxic component of the toxin made by these bacteria. The vaccine stimulates the body’s immune response to the cholera bacteria, without actually causing the disease. Antibiotics can also work, if the bacteria are susceptible, as they are so far in Haiti. What about cholera vaccine? Morris notes that a study in Bangladesh2 found that vaccine was effective enough — in terms of cost and impact — to be worthwhile in Haiti. Although cholera vaccine is only about 60 percent effective, the resulting “herd immunity” would greatly reduce the total toll. A vaccine could “play a critical role” in Haiti, where there is concern that the organism may become permanently established, “and public health is lousy,” Morris says. The World Health Organization suggests that “Cholera vaccination should be used in conjunction with other interventions. Vaccination provides an immediate short-term response while the longer term interventions such as improving water and sanitation are put into place.” WHO does not suggest blanket immunization in cholera zones. Streets and pathways are flooded after the passing of Hurricane Tomas in Gonaives, north of Port-au-Prince, Haiti. 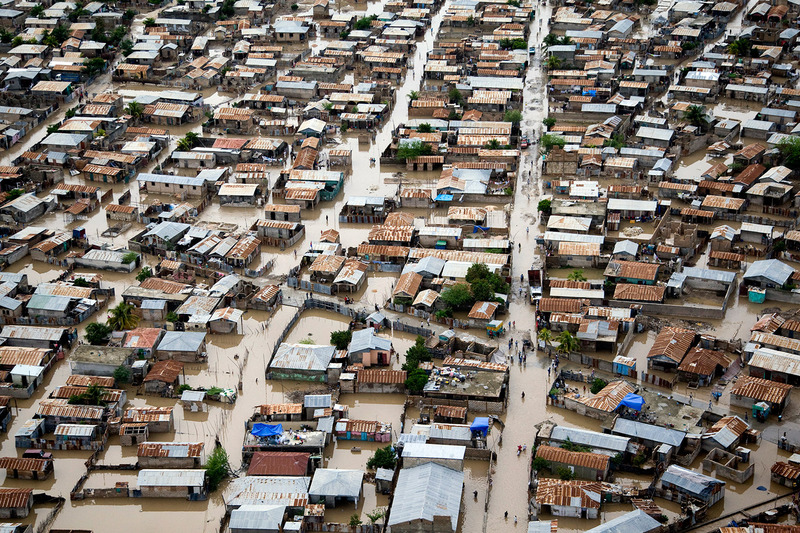 Flooding like this can overwhelm infrastructure and contribute to a cholera epidemic. High temperatures could accelerate the growth of the cholera bacterium, and heavy rainfall can overwhelm or obliterate sanitary infrastructure, loosing cholera on the population. In 2010, Haiti’s air temperature was significantly above average, says Colwell, and in the fall, Hurricane Tomas unleashed 10 centimeters of rainfall on Nov. 5, 2010 alone, just before the cholera epidemic began. Although warmer temperatures accord with the global warming trend, the connection between warming and hurricane numbers and intensity is debated. Beyond disrupting life and creating a nightmare for refugees, the earthquake may have fed the cholera epidemic by causing a giant grinding motion in bedrock, releasing ground-up limestone that raised river pH to 8.6. “This is the alkalinity we use to enrich for Vibrio cholerae in the laboratory,” Colwell says. 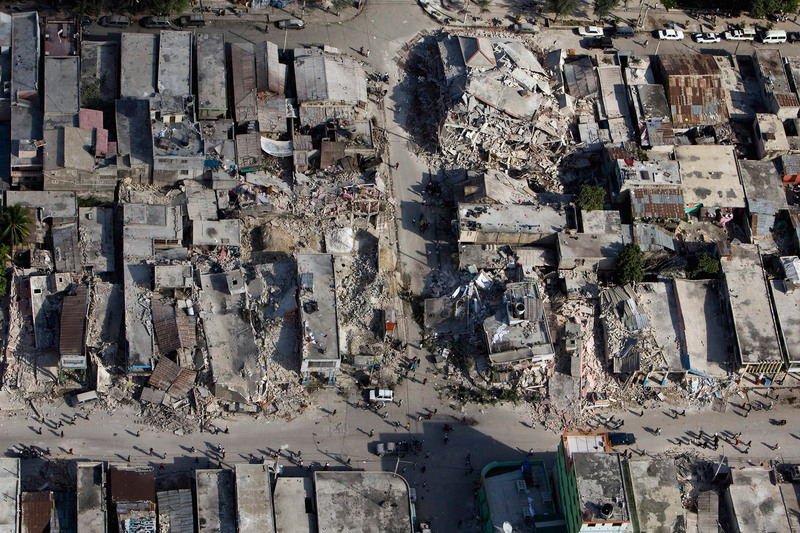 The downtown of Port au Prince, after an earthquake magnitude 7.0 rocked Haiti on January 12, 2010. The quake was one of many factors that set the stage for a cholera epidemic. But what good is understanding weather that conduces to cholera, if it’s impossible to change the weather? Because forecasting an epidemic could be extremely useful, Colwell says. When cholera threatens, local authorities can promote hand washing and water cleanliness. They can distribute vaccines and stock oral rehydration packets before the watery diarrhea starts and the dying begins.